Ven. Thubten Semkye was the Abbey’s first lay resident. 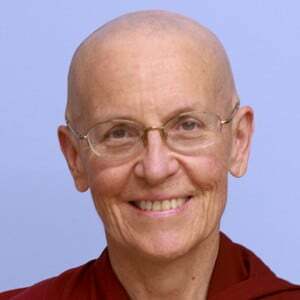 She met Venerable Chodron at the Dharma Friendship Foundation in Seattle in 1996 and took refuge with her in 1999. When the land was acquired for the Abbey in 2003, Ven. Semkye coordinated volunteers for the initial move-in and early remodeling. 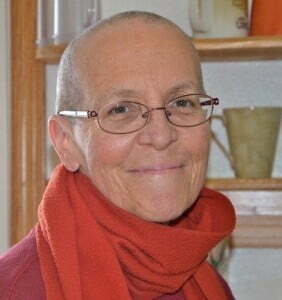 A founder of Friends of Sravasti Abbey, she accepted the position of chairperson to provide the four requisites for the monastic community. Realizing that was a difficult task to do from 350 miles away, she moved to the Abbey in spring 2004. Although she didn’t originally see ordination in her future, after the 2006 Chenrezig retreat when she spent half of her meditation time reflecting on death and impermanence, Ven. Semkye realized that ordaining would be the wisest, most compassionate use of her life. She became the Abbey’s third nun in 2007. See her ordination photos. In 2010 she received bhikshuni ordination at Miao Fa Chan Temple in Taiwan. See photos. Ven. Semkye draws on her extensive experience in landscaping and horticulture to manage the Abbey’s forests and gardens. She is an offering service coordinator and helps to oversees Offering Service Saturdays during which volunteers help with construction, gardening, and forest stewardship.